We had such an amazing discovery for our project; we got the first picture of an aardwark (Orycteropus afer) on our camera traps. The aardvark is a nocturnal, shy and difficult animal to see, his diet consists of termites and ants. Due to tracks and digging holes, we knew that they were on the property but we never had any pictures of them. In the last two months there has been a lot of incredible sightings; spotted hyenas (Crocuta crocuta) killing a baby elephant, bat-eared fox (Otocyon megalotis), leopard (Panthera pardus), spoors of lions (Panthera leo), giraffe (Giraffa camelopardalis) fighting, porcupine (Hystrix africaeaustralis) around the camp, a big heard of eland and numerous sighting of elephants (Oxodonta africana). Volunteers and staff removed 120 snares during the period of September and October; 174 snares have been removed since the beginning of the year! Sadly some are not as lucky and have been caught in these horrific traps. During these 2 months we sadly saw a dead impala caught in the snare and a baby elephant with a snare around his leg that had been killed by hyenas. If the hyena hadn’t ended its misery the poor young elephant would have died of infection. If you want to have more information about anti-poaching, please refer to the report of March and April 2015. Fire is always an enemy during the drought. Everything (grasses, bushes and trees) is so dry that lightning reaching the ground can start a fire. This is what happened at the end of October. 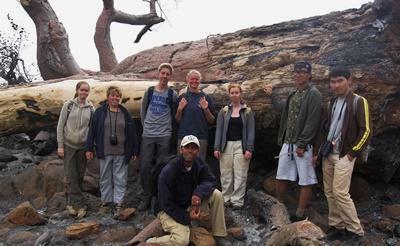 Volunteers and staff were brave and fought it during several days. 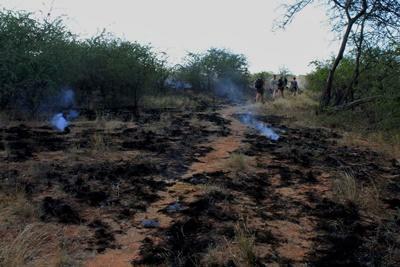 The techniques to stop a fire can be multiple: back burn is the best but needs to be handled by experts. You do not want your fire to become unpredictable. Using branches, shovels and water to stop fire is also a good technique. The wind during these few days was just unbelievable, that makes the task much harder. Luckily with dedicated volunteers and the help of the villagers we have been able to stop the fire. A lot of trees have perished, the grasses are gone, and animals start to move where food is available. 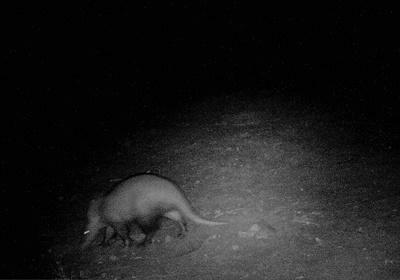 The last 2 months we have been surveying the north of the property thanks to our camera traps. The goal was to know the species present there. We placed 3 cameras, two in front of a waterhole which have been filled up with the early rain of August and one on a path used by the wildlife. We have pictures of pretty much all species: elephant, giraffe, leopard, spotted hyena, black-backed jackal, impala, eland, greater kudu, plain zebra and the shy aardwark. Such a discovery! It is really interesting to know all this wildlife is living there, where the water is rare.